This online version of the minutes includes link to all appendices in .pdf. IIn addition to this on-line version, the minutes and its appendices will published as one large .pdf file. President Chryssy Potsiou opened the 39th General Assembly by welcoming all delegates to Christchurch, New Zealand and the second General Assembly during this four-year term. The President expressed her gratitude to members and delegates for their participation and acknowledged the hard work of NZIS and the local organising committee to ensure that this Working Week could take place at the Horncastle Arena knowing the rebuilding projects that takes place all over the city. The President mentioned that she was aware that some had had difficulties getting visa to New Zealand, and appreciated those who had managed to come. The President welcomed Honorary Presidents Bob Foster, Stig Enemark and Teo CheeHai to the meeting and noted several greetings and apologies that were received from member associations and other members. The President informed that unfortunately, two vice presidents, Pengfei Cheng and Bruno Razza, were not able to attend the Working Week. Both send their greetings and apologies to the General Assembly. Vice President Rudolf Staiger took the roll call. The roll call was done for member associations only. Recorded that only member associations that have paid all their membership fees to the end of 2015 were allowed to vote at the meeting. A list of member associations that were not allowed to vote was published and posted on the FIG web site 12 April 2016. Appendix to items 2 & 22: Roll Call including information on member associations that were not allowed to vote at the General Assembly because of unpaid membership fees for 2015, as updated on 2 and on 6 May 2016. 50 member associations out of 103 were present at this session, which is more than one third of the membership needed for the General Assembly to be constitutionally valid. The General Assembly shall appoint two persons as tellers for the entire General Assembly. The tellers will represent the member association hosting the current (NZIS), President Mark Allen and the host of the proceeding General Assembly (MIL/MAKLI, Finland) Martti Pietikainen. Motion: That the General Assembly appoints President Mark Allen from NZIS and Martti Pietikainen from MIL/MAKLI as tellers for this General Assembly. The Agenda for the General Assembly was issued as mandated, two months prior the General Assembly on the FIG web site and also sent digitally and by post to all members. Appendix to item 5: Minutes of the General Assembly in Sofia, Bulgaria, May 2015, without appendices. 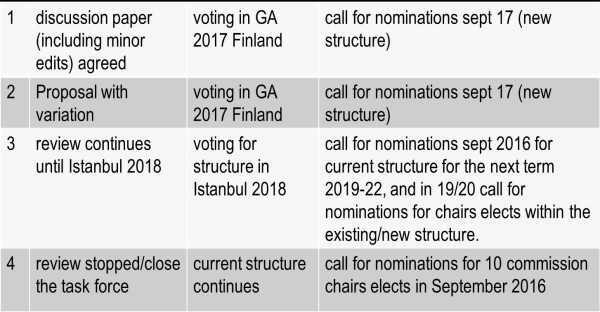 FIG Council has received the following applications for member association since the 38th General Assembly. Géographie, Topographie, Hydraulique, Energie et Construction (GEOTHECO), Uganda has applied for association membership. The association was established in 2008. Their total membership (all categories) is 42. Géographie, Topographie, Hydraulique, Energie et Construction (GEOTHECO) fulfills the criteria of FIG Member association. Motion: That the General Assembly admits Géographie, Topographie, Hydraulique, Energie et Construction (GEOTHECO), Uganda to become a member association of FIG. The South African Geomatics Institute, SAGI, South Africa has applied for membership. The association was established in 2004. Their total membership (all categories) is 570. SAGI fulfills the criteria of FIG Member association.There is already a member association from South Africa, and they have approved the application of SAGI. Motion: That the General Assembly admits The South African Geomatics Institute, SAGI, South Africa to become a member association of FIG. Decision: The motion was adopted and the FIG President gave Peter Newmarch, President of SAGI the membership certificate. FADA was unfortunately expelled at the General Assembly in 2014 due to lack of payment. FADA has announced that they would like to return to FIG and has agreed to pay old arrears together with the 2016 membership fee. FIG Council has decided to reinstall FADA and to bring this decision forward to the General Assembly. Motion: That the General Assembly admits to reinstall Federación Argentina de Agrimensores (FADA) Argentina as member association. Decision/Action: The motion was adopted. The College of Engineers and Surveyors of Puerto Rico (MA-10069) has regrettably decided to resign from FIG. FIG Council is thankful that the College of Engineers and Surveyors of Puerto Rico has cleared all arrears and there are no outstanding dues. FIG thanks the association for all the work they have done throughout the years they have been member FIG looks forward to a time where they will find it fit to rejoin our global community. Motion: ThThat the General Assembly notes the resignation of the College of Engineers and Surveyors of Puerto Rico. The Irish Institution of Surveyors has regrettably decided to resign from FIG, since they have merged with RICS, UK and will be represented through RICS from now on. FIG General Assembly had to expel National Order of Cameroon Surveyors (NOCS) in 2014 due to lack of payments. Now, FIG Office has received full payments from previous years and for 2016, and FIG council recommends to General Assembly to reinstall the association and bring this decision forward to the General Assembly. Motion: That the General Assembly reinstalls National Order of Cameroon Surveyors (NOCS) and bring this decision forward to the General Assembly for endorsement. FIG Council has discussed the situation for the Licenced Surveyors Association in Palestine and deem that Licensed Surveyors Association in Palestine, Palestina to have suspended status taking their current situation into consideration. And that Licensed Surveyors Association in Palestine, Palestina (MA-10065) will be registered under suspension status for the year 2016. It was noted that Croatian Geodetic Society, Croatia and Fiji Institute of Surveyors, Fiji paid their arrears during the week and their membership was restored at the second session of the General Assembly. With the reinstatements, admissions and expulsions, the number of member associations is 105 from 91 countries. In accordance with its administrative measures, FIG Council, has decided to continue to defer for 2016 the issuance of a membership subscription invoice to the Order of Syrian Engineers and Architects, OSEA as all efforts to maintain contact with them has not yielded results, will deem their membership in suspension giving due consideration to its internal situation. As reported in the General Assembly 2015, there remain existing sanctions on Iran, but this might change during 2016. The FIG office in Denmark cannot for the time being receive payments from Iranian Professional Society of Surveying Engineers (ISS). Ukrainian Society of Geodesy and Cartography has also gained suspended status and has not been invoiced for 2016. Again in accordance with its administrative measures, FIG Council deem their membership to be in suspension. The situation with these associations will be reconsidered by Council again in 2017. Reinstallment: Dubai Municipality (AF-20032) – has returned as member of FIG and paid all arrears. After these changes the number of Affiliate members is 49 from 46 countries. COWI, Denmark ((CM 30011) has changed their membership to Category D.
After these changes the number of corporate members is now 24. The number of Academic Members after these changes is 92 from 55 countries. The number of correspondents is unchanged from 2015, and amounts to one from Tonga. Decision: The motion was adopted. Membership certificates were handed out to the new members that were present, and the rest will be sent to the member by post. Minutes from FIG Member Association Forum 2015 were presented at the second General Assembly in Sofia, 21 May 2015. The following proposals were presented to the FIG Council. FIG Council promised to get back to the General Assembly 2016 with a follow up and status on these issues. Council response is shown in italics. 1.1. Establishment of a Global Surveyors Day, and that there will be a GA decision in New Zealand. FIG Council responded to this last year already. In principle FIG council endorses the idea, but the national associations should be the driver. FIG can provide a Web communication platform where national associations can exchange ideas. FIG can encourage the national associations to do some kind of happening, but cannot initiate the ideas. FIG Council has decided that FIG will not set a specific date and there will not be a General Assembly decision in Christchurch. Unfortunately FIG does not have people to carry this task through. If FIG sets a date there will be expectations that FIG will also do some kind of action. 1.2. Celebrations to be dedicated to a Surveyor of the Year and a topic from the broad field of surveying activities. Address to history group to suggest topics, and surveyors who may support the organisation of the events. FIG Council has decided not to initiate a proposal of a Surveyor of the Year. The idea is good, but again, if this is initiated there will also be expectations that there will be some action which will be difficult throughout a year. FIG can distribute information. This proposal is being implemented. In 2015, membership updates could be done electronically by the member and a text about the association included. All members are encouraged to submit a text. In the second half of 2016 the member association information will be available of FIG. This feature has existed for many years on the web site. If a link is missing members are encouraged to contact FIG Office. It is decided and included in the Statutes and Internal Rules that the FIG language is English. It will not be possible for FIG to translate the information from national associations into other languages. FIG information (from web site) is already translated into various languages, and if a national member can formally translate the FIG information to another language, FIG Office will be happy to upload this on the FIG web site. FIG also encourages the national associations to include information about FIG in their national language on their national web site to spread out the information about FIG to as many as possible. FIG Council will work on making the benefits of being a member more visible. There are many benefits for a national association – some are fairly easy to describe, but many are intangible and difficult to measure. A first step could be for the national associations to include more information about FIG on their national web sites (as mentioned in 2). FIG is an umbrella organisation, and is not working on a consultancy basis. It is not possible for FIG to engage in single cases, nor provide direct professional support, but FIG works on general principles that can be used by many, e.g. through the FIG Publications. There are no single solutions applicable to all, therefore it is not possible to use FIG brand to approve certain solutions. FIG has been approached several times for professional support, but we cannot do this as a NGO. FIG provides a good network of experts. It is possible for members to get involved in the FIG technical commissions and through this channel get/provide information and get involved in the compilation of publications, etc. Therefore members (and potential members) are encouraged to participate in the work that is taking place in FIG especially through the commissions. It is also possible to use the LinkedIn forum (or facebook) to ask questions and receive replies. Motion: That FIG General Assembly notes the update and records its thanks to the participants of the Member Association Forum 2015 for their active role in FIG and constructive proposals. Each Commission Chair has submitted a written report on their Commission activities since the FIG Working Week in Sofia. These reports include progress reports of the Commission working groups. Each Commission will hold a meeting during the Working Week (Wednesday 4 May, 17:30-18:30). Each Commission gave a short report on Commission activities to the General Assembly apart from Commission 8, as the Chair of Commission 8 was unfortunately not able to come to Christchurch. There were comments from delegates on commission 10 in relation to BIM (Building Information Management), and how the commissions can cooperate on this theme since it is inter-disciplinary, and BIM will have a large impact in the following years. Another question was about how much the commissions cooperate with other professional groups. Motion: That the General Assembly adopts the reports of the Commission Chairs and records its thanks to the chairs and other officers of the Commissions for their ongoing contributions. Each Network Chair has submitted a written report on their Network activities since the FIG Working Week in Sofia. The Chairs of the Regional Capacity Network and Young Surveyors Network gave a short oral report on the Network activities to the General Assembly. Motion:: That the General Assembly adopts the report and records its thanks to the Chairs and the members of the networks for their ongoing contributions. Dr. Christiaan Lemmen, Director of OICRF has prepared a report on the OICRF activities since the General Assembly in Kuala Lumpur. He made a short report to the General Assembly. Mr. Jan de Graeve, Director of the IIHSM has prepared a report on the IIHSM activities since the General Assembly in Sofia. Unfortunately, the Chair, Jan de Graeve, was not able to attend. He and other members of IIHSM have attended FIG for almost 40 years each which is certainly an achievement for which the President thanked the active participants of IIHSM. John Brock, IIHSM, made a short report to the General Assembly. Mr. John Hohol, President of the FIG Foundation has prepared a report on the FIG Foundation activities from June 2014 to March 2016. He made a short report to the General Assembly. In this report he noted that this year is now the 7th time that Trimble supports the Foundation Dinner by a large contribution to the Foundation. Motion:That the General Assembly adopts the report of the President of the FIG Foundation and records its thanks to the President and members of the Board of Directors of the FIG Foundation for their past year’s work. FIG has currently four Task Forces. The Task Force assesses the progress of establishing the real property markets in the countries with economies in transition. The Task Force is chaired by Pekka Halme, Finnish Association of Geodetic and Land Surveyors MIL. A session on Real Property Markets will take place during this Working Week. The Task Force is established to investigate the usefulness and need and if justified, the steps forward in order to introduce an FIG peer review Journal (electronic or printed). The Task Force is chaired by Yerach Doytsher, Association of Licensed Surveyors in Israel (ALSI). Council expects a final proposal to be presented and adopted at the General Assembly 2017. A special session is included in the technical programme at the WW2016 where the FIG Scientific Journal will be discussed. difficult to start a journal, and especially to get it recognised, you start at the bottom. Motion: That the General Assembly adopts the report from the Task Force, notes the proposed session and time line and records its thanks to the Chair of the Task Forces and their members. The Task Force assesses the Commissions and investigates if there is a need to revise their structure and to provide a proposal on possible improvements. The Task Force is chaired by Mikael Lilje, Swedish professionals for the built environment, Samhällsbyggarna. At the General Assembly under this agenda item there was a possibility for discussion of the proposal. A summary of the comments received during the first General Assembly session and these meetings will be presented at the 2nd General Assembly session together with a proposal on how to take the Task Force forward. Do not leave out commission 9 and 10. Real estate and construction are important areas for surveyors. FIG is an inclusive federation and should remain so. There is also the option to elect 10 commission chairs (within the current structure) in 2017. Council noted the comments and reminded the delegates to attend the lunch meeting where further discussion is possible. Council furthermore invited to further discussions at regional level such as at the Workshop on Sustainable Real Estate Markets Policy Framework & Necessary Reforms in Athens, Greece and at Intergeo, October in Germany, in connection with the Africa Network meeting in November 2016, in the Asia region and if there are other possibilities in other areas. Decision: The motion was adopted and the General Assembly proposed that the President will supervise and ensure the further communication, participation and engagement of Member Associations into discussions in order to facilitate the compilation of an improved version of the proposal to be submitted in time for a new decision (either adoption or further modification) during the next Working Week. Since the 38th General Assembly, FIG has continued to collaborate with the World Bank and various agencies and structures within the United Nations. The collaboration within 2015/16 was reported by the FIG President under item 7, Presidents report. Appendix to item 14.1: Terms of Reference for the Network on Regional Capacity Development. TThe Joint Board of Spatial Information Societies JB-GIS was formally established during the FIG Working Week in Cairo in 2005 and meets annually during a major conference. The meeting of JB-GIS in 2015 was held in August 2015. FIG has collaborative MoUs with a number of the organizations who are part of JB-GIS. FIG is represented in International Construction Measurement Standard Coalition by Chair of FIG Commission 10, See Lian Ong who has been appointed chair of the Standard Setting Committee. FIG is represented in the Trustee Board by the President. IG Council has furthermore decided to join the Ethics Standard Committee. The collaboration within 2015/16 was reported by the FIG President under item 7, Presidents report. Vice President Rudolf Staiger presented the report to the General Assembly. The report includes the auditors report from 2015, official accounts (income statement 2015) and balance sheet 31 December 2015, a summary of 2015 accounts, an updated budget for 2016 and proposals for budgets 2017-2019 and proposal for membership fees for member associations in 2018. The 2015 General Assembly approved membership fees for 2017 as follows under the condition that Council would re-consider at the end of 2016 whether it would be responsible too keep the fee stable. The 2017 subscription fees were kept at the same level as for the years 2012-2015. Although the budget 2017 shows a deficit and 2018 only a small surplus, Council is also conscious of the economic condition that members are operating under and in particular member’s challenges with their national membership and budgets. Council wishes to respect this as well and both Council and FIG Office will continue to be prudent in its financial management. Council therefore proposed after reconsidering that the level of subscription for member associations for 2017 and also for 2018 to remain at the same level as in the previous years. Council has initiated a Task Force to work on how to attract corporate members and the hope is to increase the fees received by corporate members to limit the deficit or turn it into a positive result. The current Memorandum of Understanding with Chinese Society for Surveying, Mapping and Geoinformation, CSSMG on Internships to the FIG office is another way to provide support to FIG. Vice President Staiger took the possibility in his presentation to thank CSSMG very much for this contribution. Vice President Staiger commented during his presentation of the financial report that member associations should be prepared for an increase of fees for 2019. The profile templates of each candidate are attached. Each candidate had 10 minutes to introduce himself and make a presentation focussing on his/her ideas and goals for developing the FIG agenda to the General Assembly. Sunil Lalloo was unfortunately not present and there was no presentation of him. The elections will take place at the second session of the General Assembly by blind votes on Friday 06 May. The elections will take place one position at a time. If there will be no absolute majority in the first voting, second vote will be organised between those two candidates that have most votes. Motion: That the General Assembly notes the presentations of the candidates, makes its careful consideration at the elections during the second session of the General Assembly on the 06 May. The General Assembly will normally elect a Chair Elect for each of the ten FIG Commissions for term of office 1.1.2017-31.12.2018. Under normal circumstances the elected Chair Elect will be elected as the Chair of the Commission at the FIG Congress 2018 for the period 2019-2022. The General Assembly in 2015 appointed a Task Force to evaluate the current Commission structure and consider if any changes are needed. The recommendations of the Task Force on the Commission Structure and the decision of the General Assembly may or may not affect the number of commissions. Based on this on-going work, respectfully FIG Council has decided to postpone the election of Chair Elect for the 10 Commissions until the new structure has been settled or the current structure confirmed by the General Assembly. Voting for the period 2019 to 2022, for either structure scenario will take place in 2018 at the latest. Motion: That the General Assembly notes the decision by FIG Council and adopts the proposed time frame. The FIG Working Weeks are organised by FIG together with a local member association. FIG will together with the local member association have full responsibility of the arrangements and of the financial result. This offers FIG better opportunities in terms of organising events and generating revenue. Therefore the Council has to ensure that all candidates are aware of the role of FIG and split of responsibilities for organising the Working Week. This General Assembly will decide on the host for the 2020 Working Week. The FIG Council has received two bids to host the FIG Working Week 2020, and FIG Council thanks all bidding member associations for their special engagement and contribution to FIG. At the first session each candidate had 10 minutes to make a presentation of their proposal and framework of the Working Week and their bid. Decision on the venue of FIG 2020 Working Week will be made at the second session of the General Assembly on 06 May. The voting will be made by blind votes. Motion: That the General Assembly notes the submission, the summary report, and the presentations, makes its careful consideration and decision during the second session of the General Assembly on 06 May. Vice President Rudolf Staiger took the roll call. The roll call was done for member associations only. At the second General Assembly 53 Member Associations were present out of 105 representing 68 votes for the Vice Presidents. Later two more Associations arrived, in total 55 associations, and the total votes for the destination for the Working Week 2020 was 70 votes. Together with observers around 250 persons participated in the General Assembly. Canadian Institute of Geomatics (1 vote) was unfortunately wrongly listed as not allowed to vote, although they had paid their arrears on 20 April. The Council informed the General Assembly that Croatian Geodetic Society, Croatia (MA-10020) and Fiji Institute of Surveyors, Fiji (MA-10028) have paid their arrears after the first session of the General Assembly and their membership have been restored. President of CGS, name, gave a recently published book on Boskovic to FIG President Potsiou and NZIS President Mark Allen. The Council informed that FIG Affiliate Member ANZLIC, Australia, has back in 2013 sent a letter to FIG Office in which they announce that they would like to terminate their membership within FIG. This has not been noted nor recorded until now, and ANZLIC will be recorded as terminated in stead of expelled. With the latest amendments the number of Member Associations is 105 from 91 countries. Motion: That the General Assembly notes the updates on the Membership. This General Assembly elected two Vice Presidents for the term of office 1.1.2017-31.12.2020. Since the first General Assembly on 2 May 2016, Sunil Lalloo, Institute of Surveyors of Trinidad and Tobago has unfortunately decided to withdraw his bid due to the fact that he did not manage to come to the Working Week 2016 because of extensive work load. This means that there remain three candidates for the two positions. The elections took place by blind votes following the FIG statutes and internal rules. The elections took place one position at a time. In the first round Yerach Doytsher got 19 votes, Orhan Ercan 16 votes and Mikael Lilje 33 votes. There were no invalid votes. Total votes were 68. The second vote was then arranged between Yerach Doytsher and Mikael Lilje. In the second round Yerach Doytsher got 20 votes and Mikael Lilje 48 votes. There were no invalid votes. Total votes were 68. For the second position the vote was then arranged between Yerach Doytsher and Orhan Ercan. In the vote for the second position Yerach Doytsher got 32 votes and Orhan Ercan 36 votes. There were no invalid votes. Total votes were 68. Motion: This General Assembly elects two Vice Presidents for the term 2017-2020. Decision: The General Assembly elected Mr Mikael Lilje and Mr Orhan Ercan as Vice Presidents for the term 2017-2020 after they got the majority of the votes in the elections. FIG President Potsiou thanked all candidates for their contributions and willingness to serve FIG. FIG Vice President Diane Dumashie reported back on ACCO and Commission activities throughout the Working Week. Diane Dumashie reported back that she in the capacity as Chair of the Regional Capacity Building Network had a meeting with Rob Sarib in order to start a Regional Capacity Network in the Asia/Pacific area. FIG Foundation reported back to the General Assembly on the donations received in connection with the Working Week, hereunder from the Young Surveyors Charity Run. John Hohol reported back from the corporate members meeting on Task Force activities. Yerach Doytsher reported back from the Task Force meeting. Motion: That the General Assembly: records the report, endorses results from the meeting and endorses suggested time schedules and action items for the future work of the Task Forces. Mikael Lilje reported back on the meetings that were held on Commission Structure. Council presented a response and proposal for the next steps, also listed in item 13.4. During the Working Week there were Member Association Forum, the Director General’s/Affiliate Members Forum, Academic Members Forum and Corporate Members Meeting. Brent Jones, ESRI, reported back on the corporate members meeting incl an evaluation of the Working Week 2016. The decision took place by blind votes following the FIG statutes and internal rules. In the voting Amsterdam, Netherlands got 41 votes and Interlaken, Switzerland 29 votes. There were no invalid votes. Total votes were 70. Motion: This General Assembly decides the host and venue for FIG 2020 Working Week. The General Assembly decided that the FIG Working Week 2020 will be hosted jointly by Geo-Information Netherlands and FIG and will take place in Amsterdam, Netherlands. Ms Claire Galpin raised the issues on migration, refugees and migrants, and whether FIG can do anything on this matter. Currently this is especially relevant for the Mediterranean area. FIG President Potsiou informed that this was discussed in the Director General Forum and furthermore that FIG Council will discuss this issue in order to find out what role FIG may have. Mr Co, Co-conference Director and Chair of the Local Organising Committee from the Vietnam Association of Geodesy - Cartography - Remote Sensing gave a presentation on preparations of FIG Working Week 2019. The Working Week will be held 22-26 April 2019. Co-congress director Orhan Ercan from the Chamber of Surveying Cadastre Engineers of Turkey gave a presentation on the preparations of FIG Congress 2018. The Congress will take place 6-11 May 2018. The web site is live: www.fig.net/fig2018 and will constantly be updated. FIG President Potsiou thanked FIG members and participants of the General Assembly. President Potsiou presented at the closing ceremony certificates of appreciation to the members of the local organising committee of the XXXIX FIG General Assembly and the FIG Working Wek 2016. Special thanks were recorded to New Zealand Institute of Surveyors, NZIS and its President Mark Allen, and Co-Conference Director Simon Ironside. FIG president also gave Mr David Mitchell a certificate of appreciation for his outstanding work on the SIDS Workshop. At the closing ceremony the FIG banner was handed over by Mr Mark Allen, President of NZIS and Mr. Simon Ironside, Co-Conference Director to Mr. Pekka Halme, Co-Conference Director of FIG Working Week 2017, President Martti Pietikainen, MAKLI and Paavo Häikiö, MIL. The FIG Working Week 2017 will be held in Helsinki, Finland, 29 May – 2 June 2017. President Chryssy Potsiou presented her closing address that summarises the finding and the main outcomes of the FIG Working Week 2016. The President formally closed the 39th General Assembly of FIG Working Week 2016 with the FIG Fanfare.